Testosterone cypionate is the longest chain of testosterone. 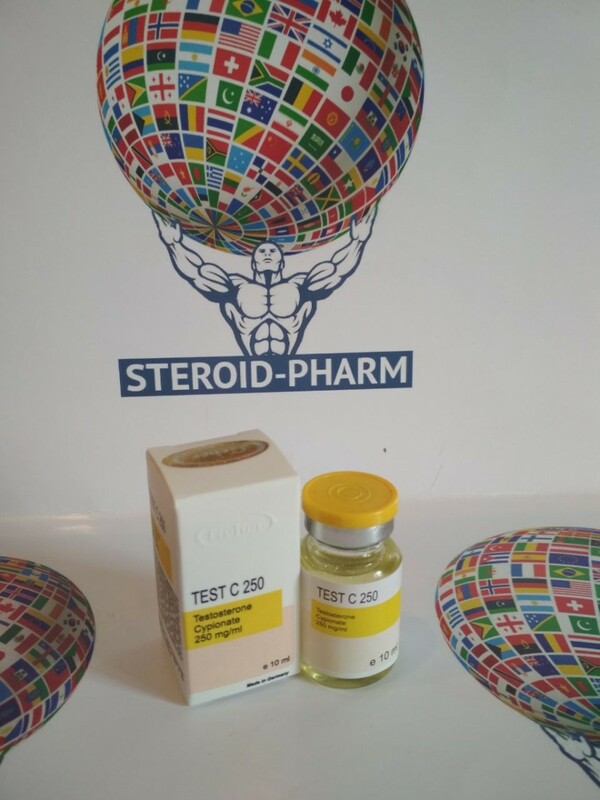 TEST C 250 is a male hormone, which is widely used in sports both men and women. Taking the drug Testosterone Cypionate improves the physiological capabilities and effectiveness of the result. The widest use of the drug is observed in America, where it is produced. Balkans are also involved in the issue. Produced in the form of injections. Testosterone is stored in fat cells for 2 weeks. The active substance gradually penetrates into the blood. This work of the drug allows you to make injections rarely, which is quite easy and convenient to use. Similar properties have with enanthate. Cypionate and enanthate can replace each other. The steroid profile is 100% anabolic and androgen from testosterone. TEST C 250 does not affect the liver and is not toxic. The action takes place through the anabolic receptors. This work keeps nitrogen, which is the material for the formation of muscle proteins. The course of taking a steroid allows the cells to hydrate. The mass rises, muscles acquire a beautiful relief. Increase the amount of oxygen supplied to the muscles. Thus, the work becomes more intense. Positive effect on spermatogenesis. Produced protein is much more than the one that is destroyed. The steroid has been active for a long time in the body. The standard number of injections is 1 time per week. A lower frequency is acceptable, but there will not be a stable high concentration of the hormone. For a set of muscle mass a dose of 250 to 500 milligrams. The use of testosterone alone gives a good effect, which does not require a mandatory combination with other drugs. This is especially positive for beginners. Increasing the dose does not make sense. Do not exceed the dose of more than 800 mg. Combination of the drug is identical to the reception separately. Sometimes combined with Nandrolone at a dosage of 200 mg per week of each drug. Tamoxifen blocks estrogens, a dosage of 10 mg every day, starting from 2 weeks and up to 2 weeks after the end of the drug. Proviron is taken in the course for the normalization of testosterone.